There are varying factors changing the landscape of, well, the landscape of the UK’s capital. London isn’t getting any bigger yet more buildings are going up; particular industries are growing and the start-up community certainly isn’t slowing down (take a look at our recent article on London’s top 5 start-ups). However, it isn’t just the lack of space pushing people out – Brexit has led businesses to question the future and stability in London, so with a hefty surge of investment into Dublin it is seemingly a viable option for corporate relocation. There have been a large number of American companies, namely banks, suggesting they may hop overseas to Ireland to set up (another) shop and take their UK base out of London. These aren’t the first murmurings of change, certain international tech firms have already done just that; Google, Facebook and Microsoft to name but a few all have swanky, sizeable offices perched upon Dublin’s riverbanks, and their imposing structure implies they are there to stay. 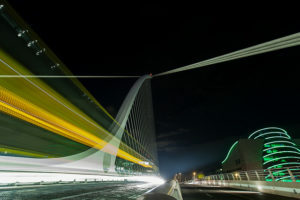 It isn’t hard to see what Dublin has to offer its suited residents – apart from some particularly favourable business tax rates. The city is home to a plethora of restaurants, entertainment and is steeped in history with many original, beautiful Georgian buildings still standing. The culture is charming and has a laid-back undertone, though there is plenty of action and hustle going on too. Additionally, there are incentives for companies who relocate staff here with tax relief options offered for any newcomers. Dublin has fully embraced its position as a Brexit back up and is geared up for growth, with the likes of WeWork and Huckletree setting up attractive ‘lifestyle’ office space here for all sorts of industries to make the most of. These aren’t the only work-space names appearing, a boom in investment and development funding has provided the city with cash-flow to continue where the recession stopped; a time where buildings were left for years unfinished and a bleak outlook has been transformed and Dublin now has a bright business future. Feel free to peruse our selection of the office space market here.